Enable monitoring for directly connected SAP Systems and their Application Servers to eliminate unwanted outages. The SAP MP solution is designed to increase the productivity of both the Microsoft System Center Operations Manager administrator and operator, providing the ability to quickly detect issues and take corrective action to avoid costly downtime. 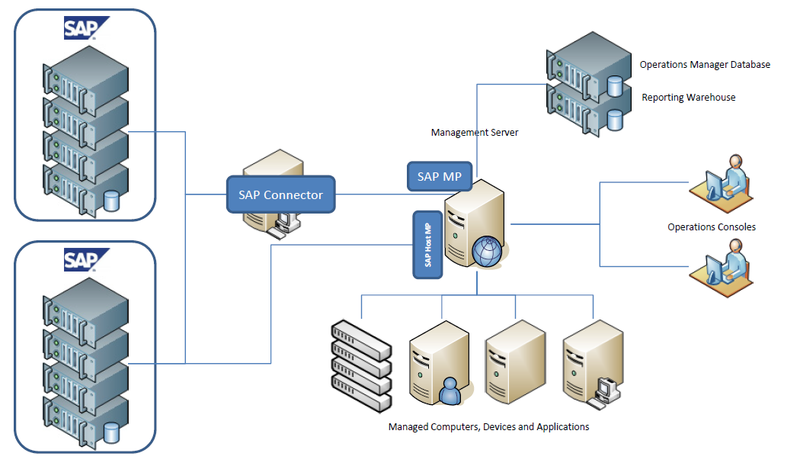 Management packs for SAP* provide availability monitoring for directly connected SAP Systems and their Application Servers. This allows IT professionals to monitor their SAP Servers according to their actual business needs, which in turn reduces the challenges they face in their day-to-day tasks. The SAP MP integrates seamlessly with SCOM. IT has an easy to deploy architecture that does not require additional servers, proxies, or appliances to be installed. It can connect directly to standalone SAP Systems or Solution Managers with automatic discovery of all satellite systems. CCMS alerts are forwarded to SCOM alert, preserving CCMS information through the use of custom fields. The Management Pack integrates with SAP Solution Manager Availability Monitoring based on CCMSPING. This integration is connected to other technical aspects which make this MP an effective monitoring tool. The SAP MP extends the SCOM view and scope. It ensures fast problem isolation and identification. This ensures a good user experience and promotes productivity and reduced downtime. The SAP MP is one of the best solutions on the market to monitor your SCOM environment. The precision development of the product ensures that this enterprise ready solution will give you exactly what you need with your monitoring solution – a comprehensive, efficient and effective solution. The integration of the SAP data into SCOM gives the IT administrator the opportunity to derive more detailed data for reporting and analysis. The SAP MP increases the productivity of both the Microsoft System Center Operations Manager administrator and operator, providing them the tools to quickly identify problems and take corrective action to avoid costly downtime. A breakdown in communication is detrimental to any business. The SAP Management Pack includes standalone SAP Background Job Monitoring functionality and integration with CCMS so that you are informed of what is happening in your SAP environment. The SAP MP can connect directly to stand alone SAP systems or to Solution Managers with automatic discovery of all satellite systems. The SAP MP allows you to customize your reports and then have the process automated. Optimize the configuration of your SAP systems. Scale up the availability of your SAP systems continuously with our unique log-monitoring capability. This is a critical function when availability needs to be guaranteed and improved.